Bu çalışmanın amacı, pedagojik formasyon eğitimi öğretmen adaylarının, öğretim ortamında etkin teknoloji kullanımı olarak tanımlanan Teknolojik Pedagojik Alan Bilgisi (TPAB) yeterliliklerinin incelenmesidir. Veriler 86’sı kız ve 143’ü erkek olmak üzere toplam 229 öğretmen adayından elde edilmiştir. Öğretmen adaylarının cinsiyetlerine, bölümlerine, yaş gruplarına ve bilgisayar kullanım düzeylerine göre TPAB yeterlilik puan ortalamaları arasında istatistiksel olarak anlamlı bir fark olup olmadığı araştırılmıştır. Araştırma sonuçlarına göre öğretmen adaylarının TPAB yeterlik düzeylerinin orta düzeyde olduğu, bölümlerine, yaş gruplarına ve bilgisayar kullanım düzeylerine göre puan ortalamaları arasında istatistiksel olarak anlamlı bir farklılık olduğu, cinsiyetlerine göre ise teknoloji bilgisi alt boyutu dışında anlamlı farklılık olmadığı görülmüştür. The present study aims to investigate the sufficiency of the prospect pedagogical formation education teachers which was referred as the Technological Pedagogical Field Information (TPAB) on effective technology usage in education environment. The relevant data was collected from totally 229 prospect teachers, 86 of whom 86 female and 143 male respondents. It was investigated that whether there is statistically significant difference among TPAB sufficiency scores of prospect teachers according to their gender, major, age group, and computer usage levels. According to study results, it was found that TPAB sufficiency levels of prospect teachers were on medium level; and there was statistically significant difference among them according to their majors, age groups and computer usage levels; and that there was no significant difference according to their genders except the sub-dimension concerning technology knowledge. Archambault, L. & Crippen, K. (2009). Examining TPACK among K-12 online distance edu- cators in the United States. Contemporary Issues in Technology and Teacher Education, 9(1), 71-88. Büyüköztürk, Ş., Kılıç Çakmak, E., Akgün, Ö. E., Karadeniz, Ş. ve Demirel, F. (2010). Bilimsel Araştırma Yöntemleri. Pegem-A Yayınları. Ankara. Cox, S. & Graham, C.R. (2009). Diagramming TPACK in practice: Using an elaborated model of the TPACK framework to analyze and depict teacher knowledge. Tech Trends, 53(5), 60-69. Georgina, D., A. & Hosford, C., C. (2009). Higher education faculty perceptions on technology integration and training. Teaching and Teacher Education, 25, 690-696. Harris, J. B., Mishra, P. ve Koehler, M. J. (2007). Teachers’ technological pedagogical content knowledge: Curriculum-based technology integration reframed. Annual Meeting of the American Educational Research Association, Chicago, IL. Koh, J.H.L., Chai, C.S. & Tsai, C.C. (2010). Examining the technological pedagogical content knowledge of Singapore pre-service teachers with a large-scale survey. Journal of Compu- ter Assisted Learning, 26, 563–573. Karasar, N. (2009). Bilimsel Araştırma Yöntemi: Kavramlar, İlkeler ve Teknikler. Nobel Yayın Dağıtım, Ankara. Kaya, O. N. (2013). Fen Bilgisi Öğretmen Adaylarının Teknolojik Pedagojik Alan Bilgisinin ve Sınıf İçi Öğretim Becerilerinin Araştırılması ve Geliştirilmesi. Tübitak-Sosyal ve Beşeri Bilimler Araştırma Grubu Projesi-1001. (Proje No: 109K541). Kaya, Z., & Yılayaz, Ö. (2013). Öğretmen Eğitimine Teknoloji Entegrasyonu Modelleri ve Teknolojik Pedagojik Alan Bilgisi. Batı Anadolu Eğitim Bilimleri Dergisi, 4(8), 57–83. Koehler, M. J. ve Mishra, P. (2009). What is technologicalpedagogicalcontentknowledge? Con- temporaryIssues in Technology and TeacherEducation, 9(1), 60-70. Koehler, M. J., & Mishra, P. (2008). Introducing TPCK. In AACTE Committee on Innova- tion and Technology. (Ed. ), Handbook of technological pedagogical content knowledge (TPCK). New York: Routledge. Koehler, M. J., Mishra, P., & Yahya, K. (2007). Tracing the Development of Teacher Know- ledge in a Design Seminar: Integrating Content, Pedagogy and Technology. Computers & Education, 49(3), 740-762. Koehler, M.J. & Mishra, P. (2005). What happens when teachers design educational techno- logy? The development of technological pedagogical content knowledge. Journal of Edu- cational Computing Research, 32(2), 131-152. Mishra, P., & Koehler, M. J. (2006). Technological pedagogical content knowledge: A frame- work for teacher knowledge. Teachers College Record, 108(6), 1017-1054. Mishra, P., & Koehler, M. (2005). Educational technology by design: Resultsfrom a survey as- sessing its effectiveness. Proceedings of the Society for Information Technology & Teacher Education International Conference 2005, (pp. 1–7). Ömer Şimşek, Servet Demir ve Birsen Bağçeci, İ. K. (2013). Examining Technopedagogical Knowledge Competencies of Teacher Trainers in Terms of Some Variables. Ege Eğitim Dergisi, 14(1), 1–23. Öztürk, E. (2011). Sınıf Öğretmeni Adaylarının Teknolojik Pedagojik Alan Bilgilerinin Bazı Değişkenler Açısından Değerlendirilmesi. Uşak Üniveristesi Sosyal Bilimler Dergisi, 6(2), 223–228. Öztürk, E. ve Horzum, M. B. (2011). Teknolojik pedagojik içerik bilgisi ölçeği’nin Türkçeye uyarlaması. Ahi Evran Üniversitesi Eğitim Fakültesi Dergisi, 12(3), 255-278. Mihra, P. & Koehler, M.J. (2006). Technological pedagogical content knowledge: A framework for teacher knowledge. Teachers College Record, 108(6), 1017–1054. Russell, M., Babell, D., O’dwyer, L. ve O’Connor, K. (2003). Examining teacher technology use: Implications for pre-service and in service teacher preparation. Journal of Teacher Education, 54(4), 297-310. Schmidt, D.A., Baran, E., Thompson, A.D., Mishra, P., Koehler, M.J. ve Shin, T.S. (2009). Technological Pedagogical Content Knowledge (TPACK): The Development and Valida- tion of an Assessment Instrument for Preservice Teachers. Journal of Research on Techno- logy in Education, 42(2), 27. Shin T.S., Koehler, M. J., Mishra, P., Schmidt, D. A., Baran, E., & Thompson, A. D. (2009). Changing Technological Pedagogical Content Knowledge (TPACK) Through Course Ex- periences. Proceedings of Society for Information Technology & Teacher Education Inter- national Conference 2009, (pp. 4152-4159). Sancar-Tokmak, H., Konokman, G. Y., & Yelken, T. Y. (2013). Mersin Üniversitesi Okul Ön- cesi Öğretmen Adaylarının Teknolojik Pedagojik Alan Bilgisi (TPAB) Özgüven Algılarının İncelenmesi. Ahi Evran Üniversitesi Kırşehir Eğitim Fakültesi Dergisi, 14(1), 35–51. Soong, S.K.A. & Tan, S.C. (2010). Integrating technology into lessons using a TPACK- based design guide. Proceedings ascilite Sydney, Australia. Şahin, İ. (2011). Development Of Survey Of Technologıcal Pedagogıcal And Content Know- ledge (TPACK). The Turkish Online Journal of Educational Technology, 10(1), 97–105. Yavuz-Konokman, G., Yanpar-Yelken, T., & Sancar-Tokmak, H. (2013). Sınıf Öğretmeni Adaylarının TPAB’lerine İlişkin Algılarının Çeşitli Değişkenlere Göre İncelenmesi: Mersin Üniversitesi Örneği. 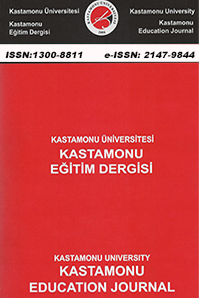 Kastamonu Eğitim Dergisi, 21(2), 665–684. ISNAD YAĞCI, Mustafa . "PEDAGOJİK FORMASYON EĞİTİMİ ÖĞRETMEN ADAYLARININ TEKNOPEDAGOJİK EĞİTİM YETERLİLİKLERİNİN ÇEŞİTLİ DEĞİŞKENLER AÇISINDAN İNCELENMESİ". Kastamonu Eğitim Dergisi 24 / 3 (July 2016): 1327-1342.